So you’re at the coffee shop, and you’ve walked over to the counter to order another half-frap-double shot raspberry no fat mocha, and left your iPad (or iPod) plugged into your laptop. Suddenly, that skeevy looking fellow who was sitting two tables away makes a grab for your iPad, and runs for the door! You don’t see him because you were looking away, but you still know your kit has been boosted! How do you know? Well, you had the PadLock installed. Well first, the bad news; your iPad is gone. Not a whole lot you can do about that, except maybe hope you had the MobileMe stuff installed, and that’s a whole different subject. What you do know is when your precious was stolen. How do you know? You have a little application called PadLock installed. 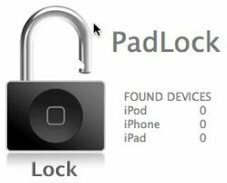 PadLock is the latest from software developer Kitchen Budapest, and tells you whenever your iPod, iPhone, or iPad is unplugged from your Mac. If at any time, these devices are unplugged from your computer, the PadLock software makes a loud noise, alerting you to the potential theft. How do you stop the alarm? Well, you can either plug your portable device back into your computer, or simply go into the software and disable the alarm. Luckily, this software is free, and open source. At any rate, you can download this program directly from Kitchen Budapest, and start feeling that warm safe sensation of absolutely no security provided by their software.